I have A LOT of candles, like honestly they’re taking over our home, I’m always burning one or a few of them and I like to use up a candle before starting another one. Last year I stocked up on some of My Dearly Loved’s Candles With Character and Lyn also sent me some more along the way, so I’m still making my way through them all, but any time I light a new one, I’m always floored by how great they are. Looking for a cool treat while visiting Main Street on a sunny day? 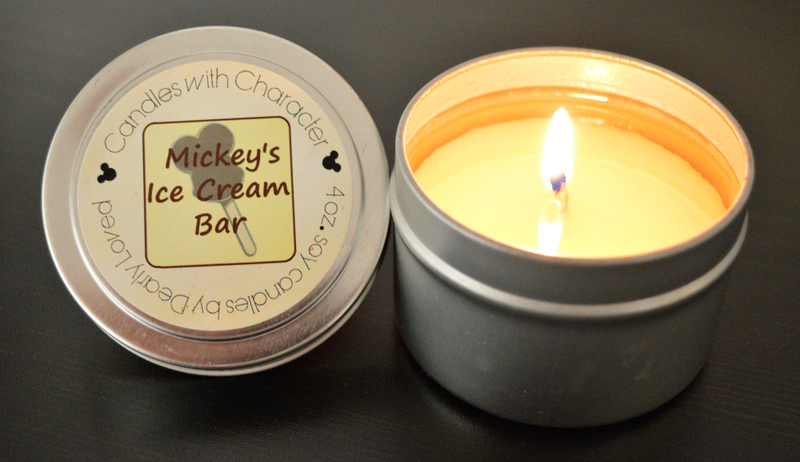 Look no further than a Mickey’s Ice Cream Bar! I often find vanilla scents too sweet and chocolate scents too fake, but Lyn is a master scent mixologist and she really nailed this fragrance combination. The vanilla smells like real vanilla extract, it’s not too sweet and the chocolate element, smells more like pure cocoa and is not too overpowering making it just all so luxurious and delectable. The scent throw was fierce but oh gosh it made me want ALL THE ICE CREAM! All Candles With Character products are made with soy wax and hand poured into a lidded and footed tin and crafted with the finest ingredients. You can just see how much, time, thought and love goes into each product that Lyn makes, which is why I’m such a huge fan of them. I can’t recommend them enough. Stay tuned for more reviews from us but until then be sure to check out My Dearly Loved on Etsy for lots of fabulous Disney inspired goodies. You can also find Lyn on Facebook, Instagram and on Twitter. You are SO incredibly kind. What a treasure of a friend I’ve found in you. Thanks, as always, for the review.